For the first time all spring, the media was able to see three periods of practice. 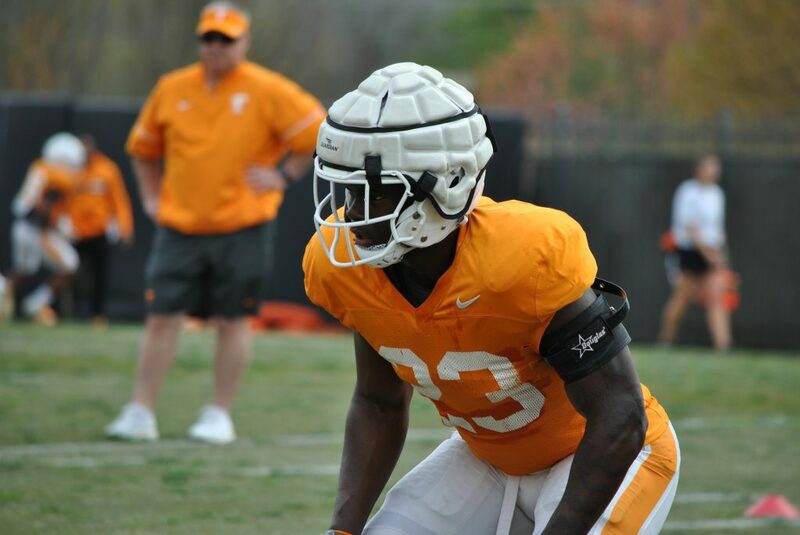 Tennessee took to the practice field on Tuesday to kick-off their final week of practice this spring. Here are my observations from Tuesday’s practice session. Jeremy Pruitt has consistently praised the redshirt junior this spring for his improved leadership, and it was on full display Tuesday afternoon. Early Tuesday, Pruitt mentioned that Guarantano had as bad of a practice as he has had all spring on Saturday during UT’s second scrimmage. That wasn’t the case on Tuesday, at least not during the open portion of practice. Guarantano made several good throws, and I didn’t see any of his passes hit the ground. As for Maurer and redshirt-freshman JT Shrout, the youngsters continue to battle with consistency. Maurer and Shrout will both make a nice throw and then follow it up with a poor one. Shrout was as good I’ve seen him this spring on Tuesday. The wide receivers started off practice working on their blocking, as they worked on tracking the defensive backs and striking them with proper technique. They then ran several different routes with the quarterbacks throwing them the football. As has been the case this spring, Jauan Jennings, Marquez Callaway, and Josh Palmer continue to look good. Rarely does a ball hit the ground, and rarely is it their fault when it does. Brandon Johnson, however, did have two drops. Jim Chaney continues to work with the quarterbacks and wide receivers alongside Tee Martin during the open portion. Martin leads the drills. Once again, the tight ends were not seen catching any footballs during the three periods we were able to see. Instead, they continue to work with the sleds as Brian Niedermeyer continues to emphasize hand placement. Dominick Wood-Anderson and Austin Pope are at the front of the line in every drill. The running backs were on the far field, and after working on handoffs out of the shotgun with the quarterbacks, they caught passes out of the backfield. Will Friend didn’t seem too pleased with the performance of the offensive line during their individual drills. As the O-linemen straddled a board under a chute, Friend consistently yelled out to go through the drill with more strain. The first group of linemen to go through drills were, from left to right, Wanya Morris, Jahmir Johnson, Ryan Johnson, Nathan Niehaus, and Marcus Tatum. Just before the open portion of practice ended, the offensive line and defensive line teamed up to go against each other. It wasn’t the traditional five-on-five, but rather a defensive end versus a tackle and a guard, and then defensive tackle versus the left guard, center and right guard. Defensively, John Mincey, Matthew Butler, LaTrell Bumphus, Aubrey Solomon, and Ja’Quain Blakely worked at defensive end. Emmit Gooden, Greg Emerson, Kurott Garland, and Kingston Harris all worked at defensive tackle. Defensive line coach Tracy Rocker praised Mincey and Butler on multiple occasions. As for the rest of the defensive units, they spent the three open periods focusing on using proper technique. Working under a chute, the inside linebackers worked on striking blockers. They then worked on gaining depth in coverage. Will Ignont and Daniel Bituli were at the first of the line in each drill. The outside linebackers worked on striking dummies and sleds. As for the defensive backs, they worked on stripping the football out of the ball-handler’s hand before Derrick Ansley worked them through back-peddling drills.